Whether indicating your name to your property or indicating the receiver of a gift, a tag is an effective tool that you can use to convey specific information. 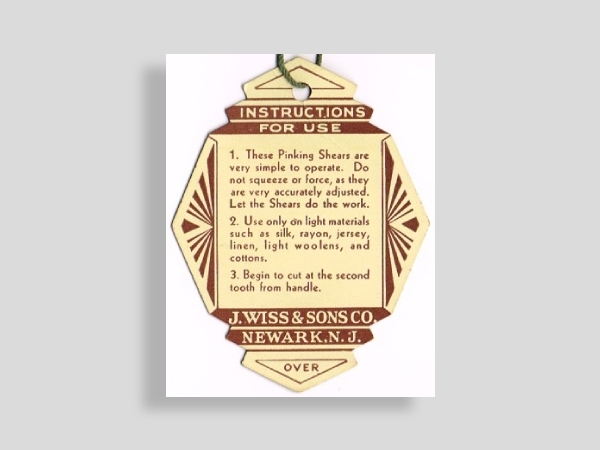 Regardless of the purpose, once a tag is made carefully with consideration on the details and information that needs to be conveyed it can help make things easily recognizable. A small detail as it may seem, it is still a cost-effective tool to use. Having an established theme will make it easier for you to design the tag. The theme will also make it easier for you to look for the appropriate images, font style, colors, etc. to use. However, establishing a theme should consider other aspects, especially when used for business, such as branding, season or occasion, promos, and so on. On a blank document, insert the shape you want your tag to be. To insert a shape, go to the Insert tab then click Shape, a drop-down of options for the shape you can insert on the page will be given. After choosing the shape, drag the cursor across the page to draw it. After that, you can adjust the points to make it the shape symmetrical and balanced. The next step is for you to add the appropriate image to your card. To use an image as a background, go to the Drawing Tools Format tab, click Shape Fill and choose the Picture option; click on the image and go to the Format and select Send to Back option. On the other hand, if you want to use an image as an accent or decoration on the tag, go to the Insert tab, click Picture then select the image you want. Then, right-click on the image and change its layout format to a square so that you can easily resize the image without distorting its quality; drag it to where it’s supposed to be. You can immediately begin typing the texts needed for your tag; however, should you decide to have a separate writing space, you can insert a text box. To do so, go to Insert tab then click Text Box, you can drag the points to fit it inside the shape you have already drawn. Grouping all the elements you have included in your tag ensures that it moves as a whole, which will help you easily duplicate it. To do so, highlight all the elements and right-click within your layout, look for the Grouping… option and click Group. Once you have everything grouped together you can now copy and paste it on the page. This will help you maximize the use of your paper in an effort to be more cost-effective. Once you have arranged your tags, go to the File tab, click the Print button and click the Print Preview option to make sure everything will be printed within the paper. Weddings are special, but so is everyone’s time. Send advance save-the-date invitations will surely help in making sure that they set a schedule for your big day. 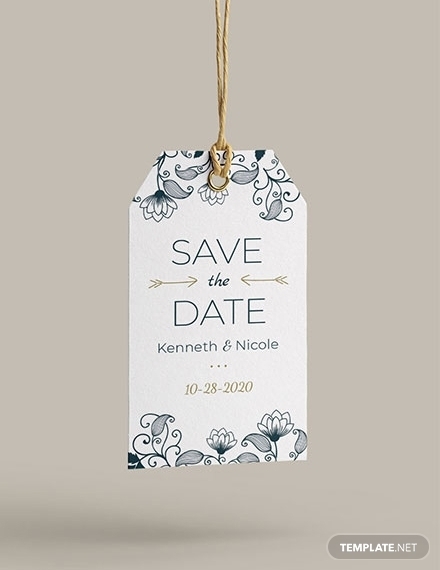 To do so in style, use this chic save-the-date tag that will show basic information about your wedding. Download this template to get a customizable layout, high-quality illustrations, chic font, and others. In the US, the Monday after Thanksgiving is a big shopping day for everyone. 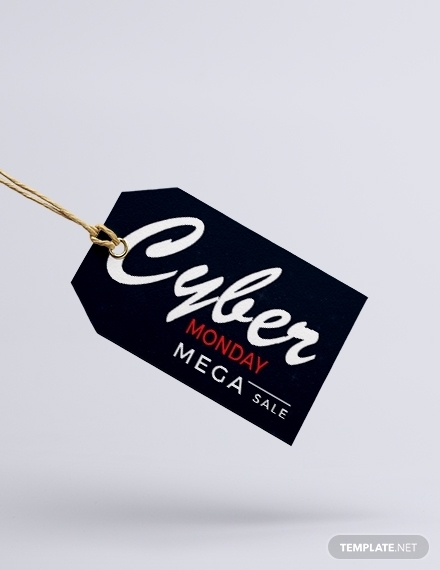 And what better way to take advantage of that moment than to effectively announce your business is participating in the big Cyber Monday Sale. Using this tag template will help get a head start in designing merch specifically for the event. You can edit this template in Adobe Illustrator and Photoshop, MS Word and Publisher, and Apple Pages. Making sure your luggage isn’t lost in the sea of luggage at the airport is one factor that can ensure a successful trip. In this case, you can use this simple luggage tag template to make sure enough information about you as the owner of the luggage is provided. The simple design makes sure that the information is emphasized without competing with messy layout and illustrations. 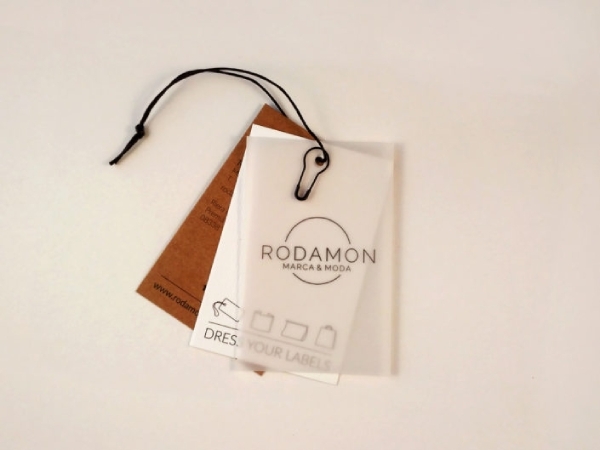 A hang tag can be used as a label for clothing apparels and other products that you produce. It can also be used as a unique way to market your skills and experience just like a business card. 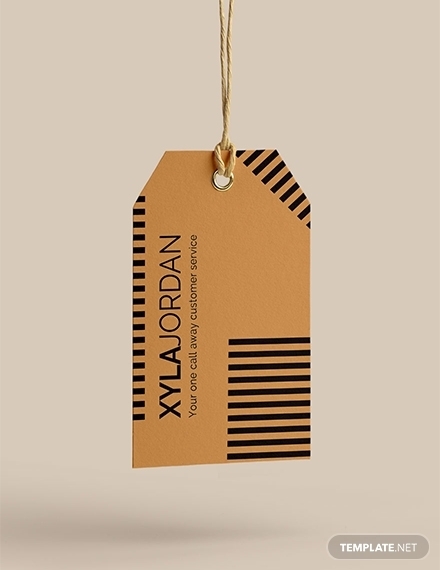 Download this hang tag template to customize for any purpose you would like to use it for. The sleek design ensures you get to incorporate all the details that you need. 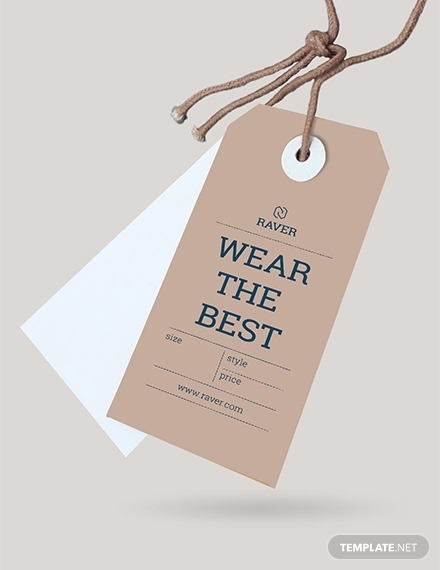 This clothing tag template is the perfect start to developing one for your own brand. The modern, minimalistic design will surely be appreciated by your buyers. This template incorporates a high-quality layout and graphics files. You can edit and customize this template to suit your brand identity. Giving favor bags after an event will always be a good way to say thanks to attendees and guests. To make sure your appreciation is conveyed clearly, you can use a favor tag; it’s basically a thank-you tag that you attach to things that you give away as a favor. Use this favor tag template to personally say your thanks to people who attended your event. To ensure customers know the price for specific items that you sell, there should be a clear price tag attached. 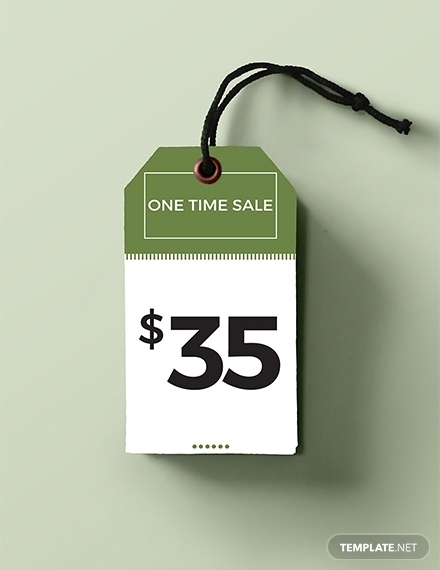 This modern price tag template boldly displays the price for the item you are selling to avoid confusion on your customers’ end. Download and edit this template in Adobe Illustrator and Photoshop, MS Word and Publisher, and Apple Pages to suit your brand and incorporate your own details. Making sure that you thank family and friends for going out of their way to attend a special day for your child’s life is always a great gesture. This baptism thank-you tag is the perfect way to send your appreciation to everyone who attended the baptism of your child. This template has a cute layout with high-quality images or illustrations, and can still be edited according to your preference. 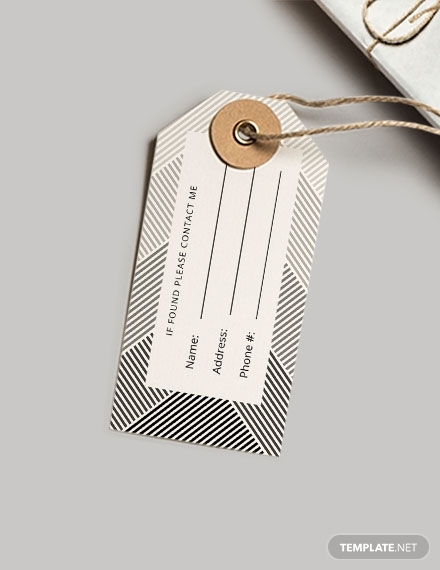 This brand tag example uses a sleek design, especially with its transparent paper front. The logo of the brand is emphasized on the front for easier establishment of brand identity and brand recognition. You can take inspiration from this sample when creating a tag for your own brand. A door hang tag is a common tag used in the hotel industry. It helps to convey messages to people without actually having to talk to them. Regardless of the color variations of the examples above, the design remains simple and direct. The message is emphasized with the absence of other attention-grabbing designs and illustrations. Talk about capturing attention! In this example, you can clearly see that the brand has curved away from the conventional shape of a tag. However, the example has still provided enough information related to its purpose regardless of its unique shape and design. And that’s about it! We hope we have given useful information about creating a tag through the guide provided in this article. The templates we have provided are free for download and use; all templates are customizable to be appropriate for your purpose and preference.